Hi D Ho! As you may know I’ve been going to bootcamp classes at Ronan Bilbow Fitness in Galway all though out my pregnancy so far (I’m currency 29 weeks with my second baby). Hi D Ho and welcome to my week 29 pregnancy update. Baby now weighs about 2 1/2 Lbs, is about 15 inches long from head to heel and is about the size of a butternut squash (yum yum, I love butternut squash 🙂 ). This week we were finally back in the hospital for a check up – we haven’t been in since week 12 so it feels like a life time ago! All went well at the check up, they did an ultrasound to check on baby and all is good – baby is a good size and head down so there really isn’t much to report. A lovely student doctor was present who examined me also, she was so polite and gentle – I really hope she keeps these skills when she’s fully qualified! The day of our hospital appointment was #NoComplaints day on twitter – one whole day of no complaints. I was a bit worried that my challenge was going to go out the window at the first hurdle as most of the appointments I have had so far have been challenging to say the least but for once it was all very calm and non-confrontational. In the end £NoComplaints day went quite well – a little positivity goes a long way! While writing this post I looked back at photos from week 29 of my last pregnancy I found lots of lovely photos from the baby shower that my lovely sister in law Paula threw for me when I was pregnant with Little Man in 2013. They were so confident I was having a boy (even though I hadn’t found out) that they had decorated the whole house in blue (good job they were right)! It was a great party but one thing I really noticed in the photos was how lovely my skin and hair looked, the elusive pregnancy glow – what happened since???????? Back to the reality of pregnancy #2 and I’m still battling crippling tiredness. On Saturday I brought Little Man for his swimming session at 11 am and came straight home to bed for the rest of the day once it was over. Dear Husband has been very good trying to do as much as possible and leaving me to rest – he even dared to pack away our prized Belleke Christmas Nativity set (yes there are still some Christmas decorations left up in the “good” sitting room that I just haven’t had time to take down. Luckily we don’t use this room very often so I can lock the door and remain in a happy state of denial about whats behind it 🙂 ). On Sunday Dear Husband disappeared off to rugby so myself and Little Man had a pyjama day for ourselves not leaving the house at all. At one point he was curled up to me on the couch when baby started kicking, Little Man got such a shock at being kicked by my tummy and was not impressed to say the least! Anyway thats my little update for week 29, hope you enjoyed it! If your expecting too, let me know how you are getting on – has the tiredness got to you too? Hi D Ho and welcome to my 28 week pregnancy update. Baby is now about 2.25 lbs and about the size of an aubergine (or egg plant in the US). Week 28 also officially marks the start of the third trimester. This week has been a real pregnancy focused week. To start with I was back with my GP for a routine check up, all is well with baby but I’m a bit run down so she felt it was best that I take a few days off to rest. So home I tottered for a good old afternoon nap and thats where I stayed for most of Thursday and Friday. You might remember from last weeks post – Week 27 and the January Blues I was finding the first week back after Christmas tough going so I really think this extra rest did me the world of good. Hi D Ho, heres my pregnancy update for week 27! Baby is now 2 Lbs in weight and about the size of a head of cauliflower. Baby is kicking so strongly and CONSTANTLY. Its really distracting when your working away in a quite office trying to concentrate on some terribly interesting report and baby keeps going “knock knock, I’m still here, knock knock” and then starts playing the drums with your tummy. Even poor Dear Husband (DH) was getting bet up by bump in bed the other night, the kicks were so strong he could feel them in his side as I was trying to sleep. 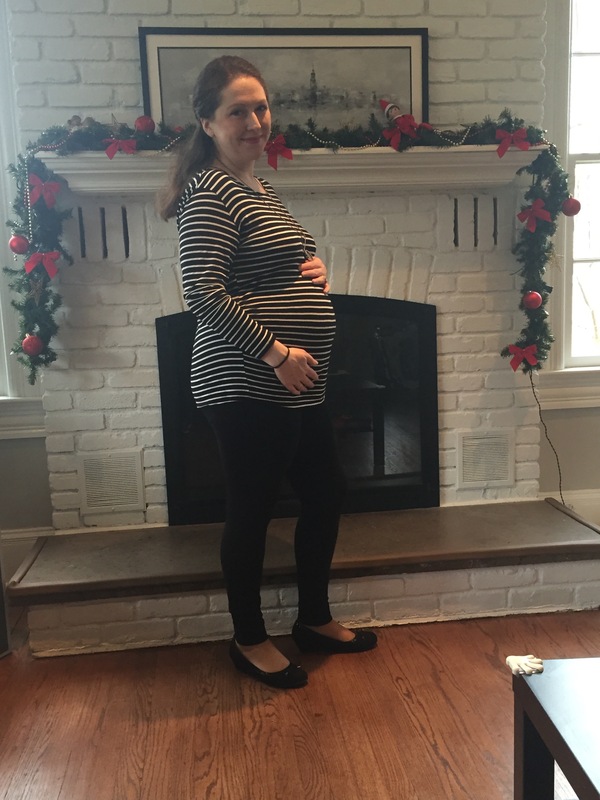 Hi d Ho and welcome to the first pregnancy update of 2016 – week 26! Baby now weighs about 1 and 2/3rds of a pound and measures about 14 inches long – about the length of a bunch of spring onions.